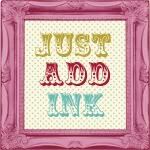 Just Add Ink Scrapbooking Challenge. hidden journaling or hidden memorabilia. I have decided to scrap about my hubby's recent Knee operation. Inside the fabric pocket is hidden (in part) his ID bracelet. Part of his vital information has been digitally stamped over for the purpose of uploading and keeping his idenitification details private, but you get the idea. I struggled to scrap this month as I have been quiet busy creating otherwise for some time and think the body/mind needed down time- however the beauty of these challenges is that they motivate you to document the things that one considers important in our lives and I'm grateful for that prompt and I got to use things that have been in my stash for 10+ years. So I'm sure you all equally have something you'd like to do too so why not join in this month and upload your layout, linked to your blog. Just click on the banner icon below to take you to the site.